Nashville, Tenn. (July 24, 2012) – In the most important hockey transaction in franchise history, Nashville Predators Chairman Tom Cigarran, President of Hockey Operations/General Manager David Poile and CEO Jeff Cogen announced today that the team has matched the 14-year, $110 million offer sheet between the Philadelphia Flyers and defenseman Shea Weber, insuring that the Predators' captain will remain with the franchise for the next 14 years. The decision to enter into the largest contract in franchise history was made by all parts of the organization, including ownership, hockey operations and business operations. -Was Shea Weber the individual that this franchise wanted to lead our team, a team that would compete for the Stanley Cup every year, for the next 14 years? -Would matching the offer sheet be in the best long-term interest of the team and organization? -Would a decision not to match the offer sheet send a negative message to current Predators players and other NHL organizations, a message that the Predators would only go so far to protect its best players and be pushed around by teams with "deep pockets?" The answer to each of the above questions is clearly “yes.” The organization spent the last several days analyzing all aspects of the offer sheet, from economic implications to the impact on the team hockey operations puts on the ice. Most importantly was the reaction to whatever decision the organization reached and the impact it would have on our fans, sponsors and marketing partners. We wanted to insure that our decision reflected not just the feelings of these groups but also conveys a strong message to them that our actions would speak for us and demonstrate our commitment to them. It was absolutely essential that they understand and believe that we are doing everything possible to ice a Stanley Cup competing team each and every season. With this decision behind us, we continue to focus on our mission: Develop Bridgestone Arena into the number one sports and entertainment facility in North America with a Stanley Cup-winning Nashville Predators team as the centerpiece. With Shea Weber in the fold for the next 14 years, we are closer to this mission, and will continue to contend for the Stanley Cup on an annual basis. 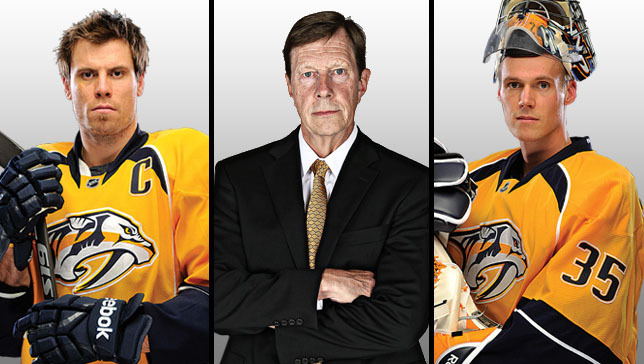 Cigarran, Poile and Cogen will be available for a media conference tomorrow at 1 p.m. CT on the Bridgestone Arena concourse to discuss the organization's decision. There will be no further comment from the Predators until Wednesday's media conference.